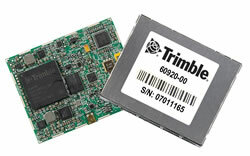 Two new GPS modules based on the award-winning u-blox 5 engine and the NEO form factor — the NEO5D and NEO5G — have been announced by the Thalwil, Switzerland–based company. Operating with an 1.8-volt power supply, the new receiver modules provide a 40 percent reduction in power consumption from alternative solutions that require 3-volt power sources, according to u-blox. The NEO-5D is optimized for low cost with its crystal-based design, while the NEO5Q offers KickStart, the rapid weak-signal acquisition technology that boosts acquisition performance and ensures positioning capability regardless of signal positions and antenna size. The modules come in a 12 x 16 x 2.4–millimeter package and include the u-blox’s SuperSense acquisition and tracking sensitivity of -160 dBm. Their ROM-based architecture eliminates the need for an external Flash EPROM. As with all of u-blox’s modules, the new NEO5D and NEO5G support the company’s free AssistNow service. Using standard user-plane communication links and protocols, AssistNow provides satellite ephemeris and almanac data, as well as accurate time and other satellite information to expedite signal acquisition and positioning. Recently, Frost & Sullivan singled out development of the 50-channel u-blox 5 in its presentation of the 2008 Global GPS Receivers Product Innovation of the Year Award to u-blox. In making the award, Frost & Sullivan cited the standalone receiver engine’s 50-channel architecture, capable of massive parallel satellite searches and its 130-nanometer CMOS technology as well as a design that will enable the receiver to simultaneously track severalGNSS systems, including Galileo. Samples of the new products are available now.